Jalie 2920 is getting a lot of love around here. Maybe because a pattern with just one piece is about my speed these days. Stylish helpfully traced the sizes for her girls out, so when I had a smidgeon of downtime I found myself cranking out a couple. If I spent half an hour on either of these I’d be surprised. I feel a bit bad because I probably should’ve left the fabric for Stylish to practice on… but there’s enough left to make a couple more pairs, anyway. I’m a little bit perplexed with this pattern, though. I get that it’s designed to stretch in length as well as width, and for snug, extra-stretchy fabrics… well, I dunno. This purple is NOT such a fabric. I mean, it’s a pretty nice, beefy knit. The amount of stretch is good. But it’s definitely not a four-way stretch. When tracing, I had Stylish give lots of extra room in the leg length, to compensate for this. I used the longest lengths here, and I’m glad I did. The Waif’s are a little long, but she seems to grow up rather than out, so that’s probably a good thing, and Fyon’s are spot on. And that’s five or six extra inches beyond the pattern’s “proper” lengths. Well, the length dictated by their heights, anyway. 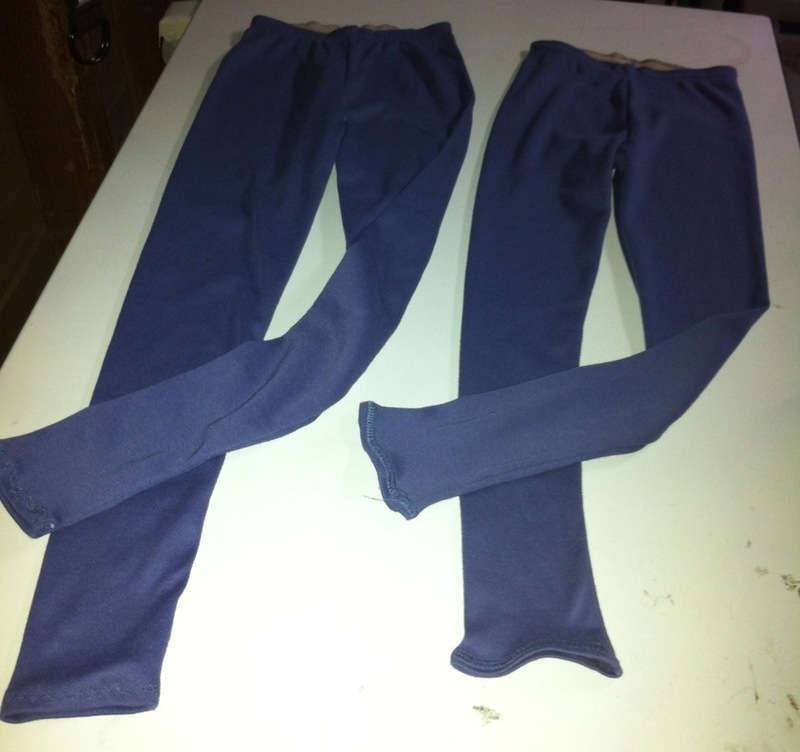 The Waif’s pair are a size 2(F), lengthened to the five length and then beyond. It’s the first time I’ve ever seen her in a pair of pants that wasn’t way loose and baggy on her. This was after I had attempted to make myself another set of leggings from some luverly denim-look knit I’ve been sitting on and petting since I acquired it around New Year’s. The whole bolt at my local Fabricland recently got marked down to half price and I’m having a hard time not rushing in and buying up the whole damn thing. I used the same Jalie 2920 as for my black leggings. However, peeps, this is where those stretch gauges on the patterns become important. This stuff is stretchy, but not leggings-type stretchy. Length was not an issue, but while I could wriggle into them, well, um, let’s just say that it was putting undue stress on the fabric. D’oh. Fortunately, as with the fleece pants, I have a suitable candidate with a derriere just a little bit smaller than my own handy in the house, so Tyo now has her first pair of jeggings. I guess I had better enjoy that while it lasts… we just had to buy her a whole new crop of skinny jeans, as the ones she got in September are getting too snug. (This is why I don’t make her jeans very often any more). The time until her hips surpass mine may be measured in months rather than years at this point. Oh, you cursed curvaceous pears. I guess I just need to get some more denim-look knit for myself. /sniffle. Sometimes those simple projects get the most wear. They look comfy for sure. Excuse me, but there’s nowt wrong with being a curvaceous pear! I’m sad to say you are getting more sewing done than I a of late. Yaaaaah, I make polar fleece pants for my 3year-old boy! By now he has about 7 pairs… I call them “guilt pants”, because I tend to make them when I feel kinda guilty for neglecting the rest of the family as I spend so much time sewing for myself. Teeeeeee-heeeeeeeeee! Simple, easy to wear projects are my favorite! Looks like you’ve got a nice stash of well-loved garments! 🙂 BTW, I can’t say that I’ve ever thought of using fleece to make pants….surely it’s not of the polar fleece (like what you get in a bunch of novelty prints) is it??? Huh. Does it hold up well? Well, it gets matted up as you wash it, though that varies with quality. So far we are all still pretty happy. Although my SIL still hasn’t hemmed hers. A hem would be better but she doesn’t want to lose the length. I’m going to have to visit you at work and take a look at that stretch denim. There was some there that I had my eye on, and if it’s not half price… Don’t worry! I only need enough to cover two legs–maybe I’ll see you on Saturday! How lovely.. I must get this pattern and find some stretchy fleece . I have to say that in a week or two I’ll be sewing up wee merino long sleeve tees by the gazillion for my kids, some for me, my folks and, well others too probably. I’ve a stack of different coloured fabric to zip through …. quick yes. Brain dead quick. Probably. Its all good really.